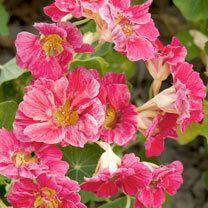 Dwarf, bushy plants producing masses of beautiful semi-double blooms in a unique cherry-rose colour. Easy to grow, ideal for dry, poor soils, and deliciously peppery if you eat the leaves, flowers or seed pods in a salad! Height 25cm (10"). Easy to grow plants that will provide a blaze of colour in borders, tubs and baskets. The perfect way to clothe a dry, sunny border. Flowers and leaves are edible and give a peppery flavour to salads. Sow March-June to flower June-September. Suggested planting space 15cm (16"). Ideal for beds and borders, patio pots and containers. Drought resistant. Prefers full sun. Plants with a rounded compact habit ideal for smaller gardens.